When I first got my phone, it had an option in settings to have a favourite app that opens when I swipe to the right from my home screen. The phone updated the other day, and this morning, I noticed that swiping right now opened some weird Google news feed thing. 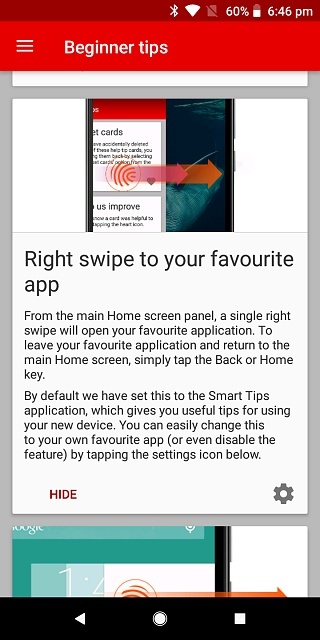 I managed to find the setting to turn that off, but it won't let me add my old favourite app back in instead. How can I set a custom app there again? You probably can't with the stock launcher, but if you install something like Nova Launcher, you can set a "swipe left to right" gesture to open almost anything. Ah, I wonder if it came with some launcher preinstalled by Vodafone. Doesn't seem to be a special launcher installed, but found where I originally set the app. This is in the Vodafone 'tips' app which came preinstalled. The setting doesn't seem to work any more. Can I ask - was the google news feed thing always there when you swipe right on the home screen, or is that a new thing? I'm just wondering if it's new, and it clashed with the Vodafone settings and broke them.